at the Oxbow at 5:30pm. plants from a resent trip. and purchasing tickets for Ciscoe. 2:45pm so we can arrive early to help set up). prepared to show your ID. winter and he will get you thinking about your next spring garden. become a local celebrity known for his beloved sense of humor. 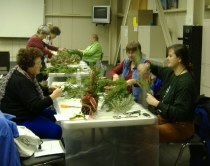 4:00 p.m. and is scheduled to end at 6:00 p.m.
PICTURES FROM CHRISTMAS WREATH MAKING MTG. Welcome to the Boeing Employees' Garden Club- Seattle web site.